Ginseng is one of the most widely used medicinal herbs with at least six species used in traditional medicine. American Ginseng is native to North America and was used for centuries by Native Americans. It is a potent adaptogen that supports the body in adapting to stress and supports the bodys immune system. In addition it supports normal levels of stamina and endurance. Our Imperial Elixir Royal Ginseng for Women is a superb dietary supplement for women in the mid-life years. American Ginseng Root is valuable as an all-purpose tonic and adaptogen intended to provide nutritive support to help the body maintain health during times of physical or emotional stress. Dried woods-grown Panax quinquefolium root. Organic Grape Alcohol Content: 55%. Dry Herb Strength: 1:4. From the manufacturers label: Prince of Peace Ginkgo Biloba and Red Panax Ginseng Extract contains 2400mg of Gingko Biloba Extract and 500mg of Red Panax Ginseng Root Extract. Liquid herbal Supplement with punch through cap. 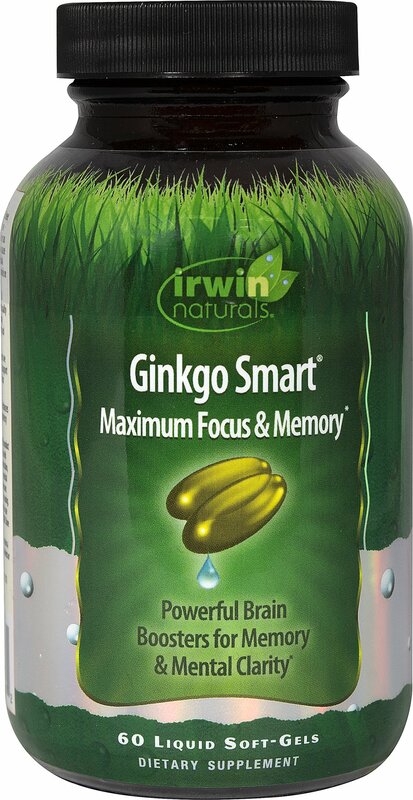 From the Manufacturers Label: Irwin Naturals Ginkgo Smart Maximum Focus and Memory is a serious formula to help you keep your mental edge. Each 275 mg. capsule contains 100% Fresh Freeze-Dried: Wildcrafted Ginkgo biloba leaf 175 mg.; Certified organically grown Centella asiaticaGotu Kola leaf 100 mg.
Fresh wildcrafted Ginkgo (Ginkgo biloba) leaf 1:1 35%; Fresh certified organic Gotu Kola (Centella asiatica) leaf 1:1 30%; Fresh certified organic Oats (Avena sativa) green seed 1:1 20%; Dried Siberian Ginseng (Eleutherococcus senticosus) root 1:1 15%. Kosher vegetable glycerine - 75%. Ascorbic acid 40-60 mg. per ml. (30 drops). Grapefruit essential oil. Acetyl L-Carnitine plays a role in the metabolism of food toenergy. The combination of Alpha Lipoic Acidand Acetyl L-Carnitine helps promote metabolic functioning to fightagainst free radicals and oxidative stress. Often used as part of ahealthy aging program. Helps support brain function. Plays arole in the metabolism of food to energy. Supports nervoussystem health. Supports Memory and Brain Function Acetyl L-Carnitine is responsible for long-chain fatty acid transport for ATP production within the mitochondria. Scientific studies show that Acetyl L-Carnitine promotes brain metabolism, memory and cognitive function, especially mild memory problems associated with aging. Use as part of a healthy aging program. Ginkgo biloba has been used medicinally for thousands of years. Today, it is one of the top-selling herbs in the United States. Ginkgos are large trees, normally reaching a height of 20–35 m (66–115 feet), with some specimens in China being over 50 m (164 feet). Ginkgo improves blood flow to the brain .Several ginkgo studies have shown that it can help with memory problems caused by dementia or Alzheimer’s disease. The only source of ginkgo is the ginkgo tree. Most ginkgo supplements are derived from the leaves. Ginkgo seeds can be dangerous, especially when raw. Ginkgo treats conditions include memory loss, headache, ringing in the ears, vertigo, difficulty concentrating, mood disturbances, and hearing disorders. Panax ginseng is a plant. People use the root to make medicine.Panax ginseng is used for improving thinking, concentration, memory and work efficiency, physical stamina, and athletic endurance.Panax ginseng is also used for bleeding disorders, loss of appetite, vomiting, intestinal problems, fibromyalgia, sleeping problems (insomnia), nerve pain, joint pain, dizziness, headache, convulsions, disorders of pregnancy and childbirth, hot flashes due to menopause, and to slow the aging process.Ginseng has been used as a medicine for over two thousand years. Today, approximately 6 million Americans use it regularly.